News is reporting that all trains, planes, trams and buses were halted in Brussels after explosions at the airport and subway station. Information continues to develop on the situation. 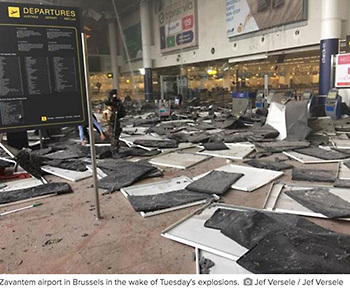 At approximately 0817L (0717 GMT) two explosions were reported in the departure hall of the BRU airport. Significant damage has been reported along with an unconfirmed number of casualties. United reports all United Airlines employees have been accounted for at this time with no injuries reported. We are working to ensure all AFA members are well and offering assistance should other unions have affected members as well. Please be aware that security is heightened at European airports and cities. Crews will see heightened security activity all around Europe. Our hearts go out to the people of Brussels and the families of those affected. Remain vigilant and alert for updates as they become available. If any AFA member needs assistance please contact AFA EAP at 800-424-2406.